“Pass it Forward” Giveaway…I have always felt it is important in life to pass it forward. This doesn’t have to be a big extravagant thing, everyday moments of putting others first can improve your life and who you are as a person. This giveaway is to encourage others to pass it forward more often and helps those around you and beyond your borders to have a better life or even just a better moment in life. I have been wanting to do a giveaway for a while now and this just seemed to be the best reason to do a giveaway. So the rules are as follows, well ” they aren’t really rules, more like guidelines”. 1. Leave a comment on this blog or on my facebook https://www.facebook.com/pages/Valerie-Baber-Designs/305306129537702 stating ideas for passing it forward or what you do to pass it forward so it may inspire others to do the same. I will also be donating 6 baby hats to a local charity to help “Pass it Forward” at my end. I am inspired by the many people who daily work to help others etc. Here are a couple of knitters and yarnies who pass it forward. There are many more who “Pass it Forward” in their business, these were two people who recently inspired me to do the same. Ancient Arts Fibre Craft dyes beautiful yarns the colour of cats which in turns helps to support a rescue cat foundation. Seattle Spinner spins wonderful yarns and just opened her Etsy store. Proceeds of her work and yarn go to help others. Check out these sites and the many more who “Pass it Forward”. I hope this inspired you to “Pass it Forward” too. I pick a charity each September (the month that my mother was born and died) and spend some time each month either making, donating or marketing for them. Last year it was the Poppy Appeal and crochet some poppies and made over £600. This year it’s Look Good Feel Better, a charity to help women deal with the ravages of cancer treatment – I’m making season specific accessories for them. It’s so important to put back – if you’re healthy and comfortable financially there are so many worse off who need a helping hand. Wow, what a wonderful way to give back in memory of your mother. I think it is a great way to honour her. My mother passed away 17 years ago from Breast Cancer and this weekend I was watching my daughter and her friends in the Run for the Cure by CIBC. I bawled! So very proud she was doing this. I am inspired by both you and my daughter do somehow pass it forward and design or make something to sell to help the Breast Cancer Society. There were over 9,000 people running or walking just in our city and it is around the world. It was amazing! Thanks so much for inspiring me to give more. I love your designs too! Very creative! 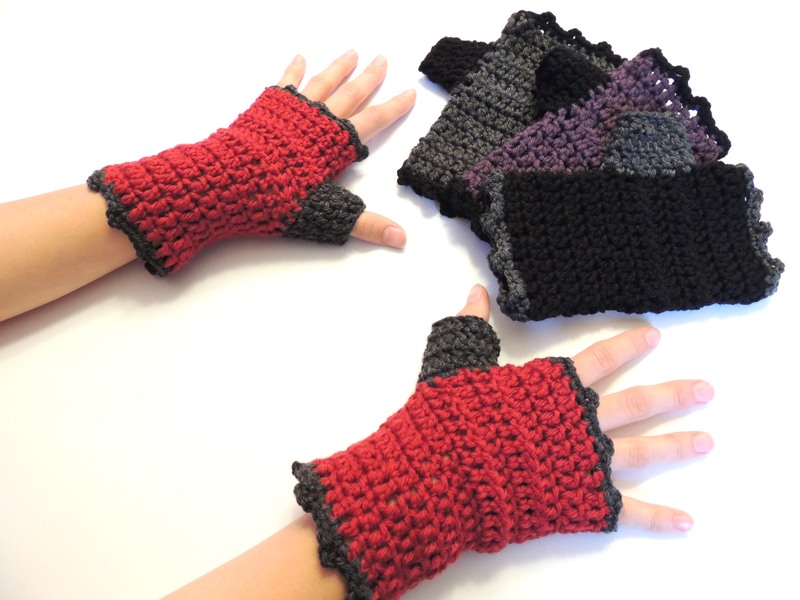 Congradulations to Monteryarns for winning a pair of the Urban Flair Lace hand warmers. Thanks for entering. Have a fabulous day. ← Two thumbs up on the thumb cozy…what’s new.